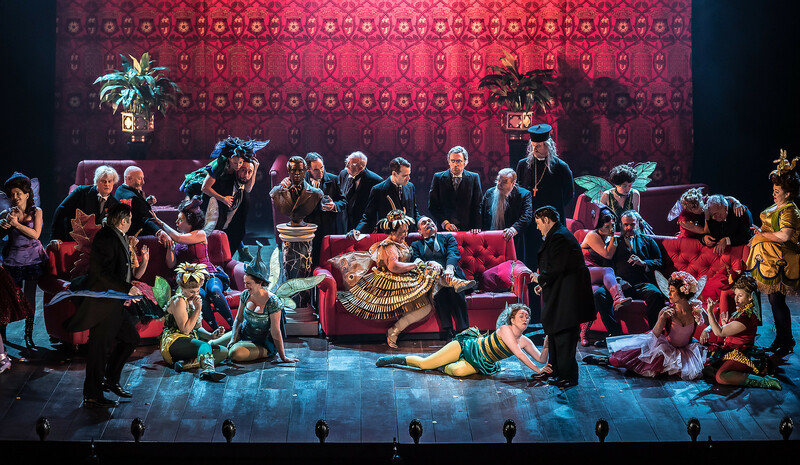 G&S seems to be making something of a welcome come-back, last year English Touring Opera gave us Patience, Opera North performed Trial by Jury, and English National Opera revived Mike Leigh's production of The Pirates of Penzance, whilst in 2016 Scottish Opera presented The Mikado. Not that G&S ever went away, but for some time there was rather dearth of their operettas on opera company stages. 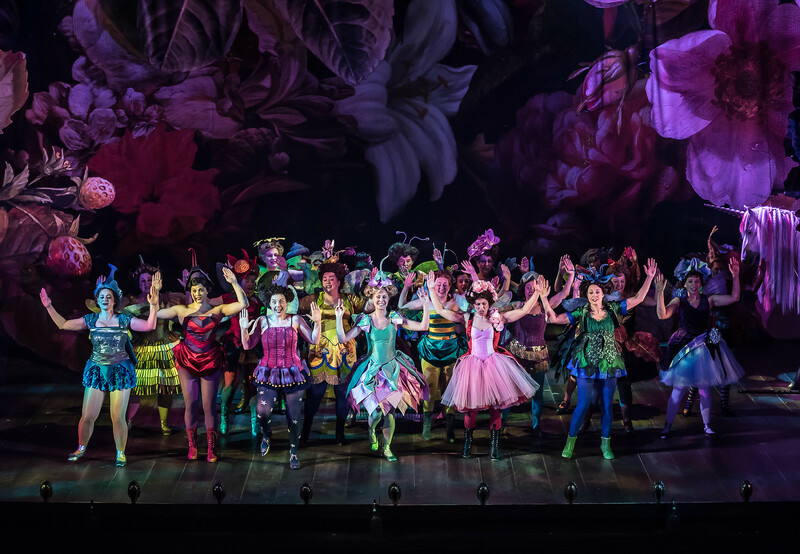 Now English National Opera has followed up The Pirates of Penzance with a joyful new production of Iolanthe directed by Cal McCrystal (best known for One Man, Two Guv'nors). Designed by (and dedicated to) the late Paul Brown, Cal McCrystal's production of Gilbert and Sullivan's Iolanthe opened at English National Opera at the London Coliseum on Tuesday 13 February 2018. Conducted by Timothy Henty, the production featured a strong cast with Samantha Price as Iolanthe, Andrew Shore as the Lord Chancellor, Yvonne Howard as the Queen of the Fairies, Ellie Laugharne as Phyllis, Marcus Farnsworth as Strephon, Ben Johnson as the Earl Tolloller, Ben McAteer as the Earl of Mountararat, Llio Evans as Celia, Joanne Appleby as Leila, Flick Fernando as Fleta, Barnaby Rea as Private Willis, Richard Leeming as the page boy and Clive Mantle as Captain Shaw. Lighting was by Tim Mitchell, choreography by Lizzi Gee and additional material written by Toby Davies and Cal McCrystal. The run of G&S operettas which I mentioned above has another thing in common, all of them (more or less) take the pieces seriously and eschew radical reinvention or re-working. G&S works best when you take Gilbert's world of topsy-turvey seriously, but that doesn't mean presenting it straight. Cal McCrystal's production kept the essential Victorian-ness of the piece, with McCrystal taking the view that Gilbert's targets in his libretto were just as relevant today without any updating. So no Brexit (or hardly any), and no mining of the trope of elderly men and young girls could easily be implicit. In this production the elderly Lord Chancellor really is in love. But that does not mean that the production was po-faced. Recognising that the London Coliseum is a big theatre, McCrystal trimmed some of the dialogue and introduced some rather ripe jokes (of an end of pier variety which worked well with Gilbert's punning humour). He also introduced a layer of physical comedy. 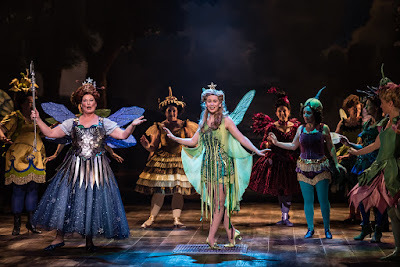 For a start the piece was highly choreographed, as it should be, with an all singing all dancing cast, which extended to giving the characters particular physical traits, so that Samantha Price's Iolanthe expressed herself in words, music and gesture. Two extra actors, Flick Fernando and Richard Leeming brought in a layer of physical comedy as well, so that in the Lord Chancellor, Earl Tolloller and Earl of Mountararat's Act Two trio, the very traditional D'Oyley Carte-style choreography for Andrew Shore, Ben Johnson and Ben McAteer was offset by a series of spectacular prat-falls by Richard Leeming. There were visual jokes too, puppets galore including a pet dog for one of the peers and sheep which appeared and disappeared (Strephon is after all a shepherd). But these extra-layers were applied carefully, adding spice rather than taking over and it was notable that McCrystal knew when to leave alone, the more complex musical numbers were allowed to blossom and the serious moments (there are always serious moments in G&S) such as when Iolanthe (Smantha Price) pleads with the Lord Chancellor (Andrew Shore) were beautifully done. It helped that the piece looked and sounded fantastic. Paul Brown had provided a false proscenium arch, and the operetta opened with classical drop curtain scenery depicting huge flowers, which changed visibly to arcadia for scene two. The fairies, all individually costumed, were very Victorian in style evoking the flower fairy prints, whilst the peers had lots of little individual touches (and there was even a Lord Bishop, as well as a Boris Johnson look-alike). There was a great coup for the entrance of the peers when they arrived in Arcadia by steam train which bursts through the scenery. The London Coliseum is a big theatre in which to do G&S and the cast was full of experienced singers. 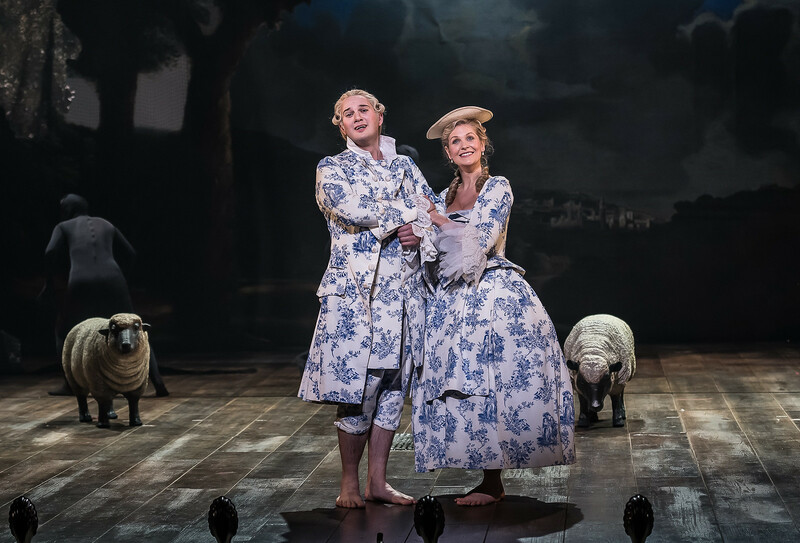 Ellie Laugharne and Marcus Farnsworth made a delightful pair of romantic leads, Phyllis and Strephon, costumed in 18th century Arcadian style complete with mock toile-de-jouy fabric! Both seemed to be having the time of their life, and it was this sense of enjoyment which radiated from the production. Both Laugharne and Farnsworth had the right degree of heft and lyrical charm to make the roles count, and their opening duet was a complete delight and they even managed to avoid being upstaged by the comic business with the sheep. And in their Act Two duet, we got a wonderful clog dance too, a brilliant touch. But of course, in this opera, it is the older generation who are the real leads. 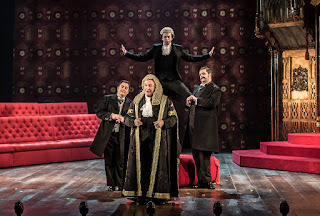 Andrew Shore's G&S credentials are long, and he brought his familiar verbal dexterity to the Lord Chancellor's nightmare song in Act Two and throughout his attention to detail was superb, whilst never guying the character. Yvonne Howard' s Queen of the Fairies was a similar delight, trenchant and po-faced, never knowing and clearly channelling the links to both Queen Victoria and Wagner's Brunnhilde which are part of the character's original make-up. She also made her first entrance flying in! 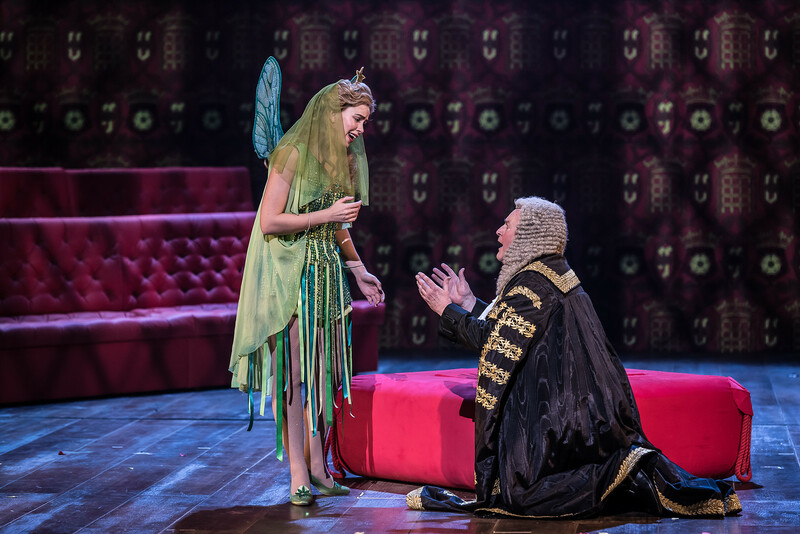 Samantha Price was a charming Iolanthe, expressive vocally and visually and was particularly moving in her Act Two solo, 'My lord, a suppliant at your feet'. 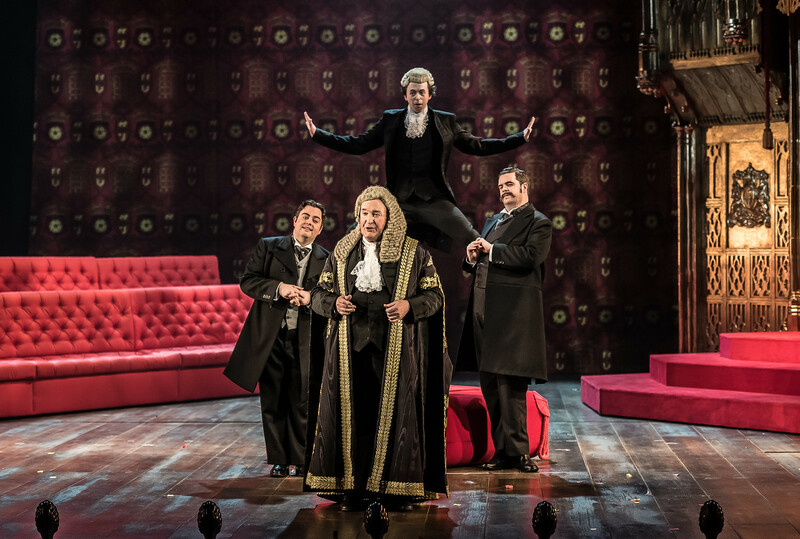 Ben Johnson and Ben McAteer seemed to be having the time of their lives as the two love-smitten Earls, all deft foot-work, delightful characterisation, and pukka accents, yet superbly sung too. Barnaby Rea made every word of Private Willis' solo count; it is one of Gilbert's more pointed jibes in an operetta full of such targets. 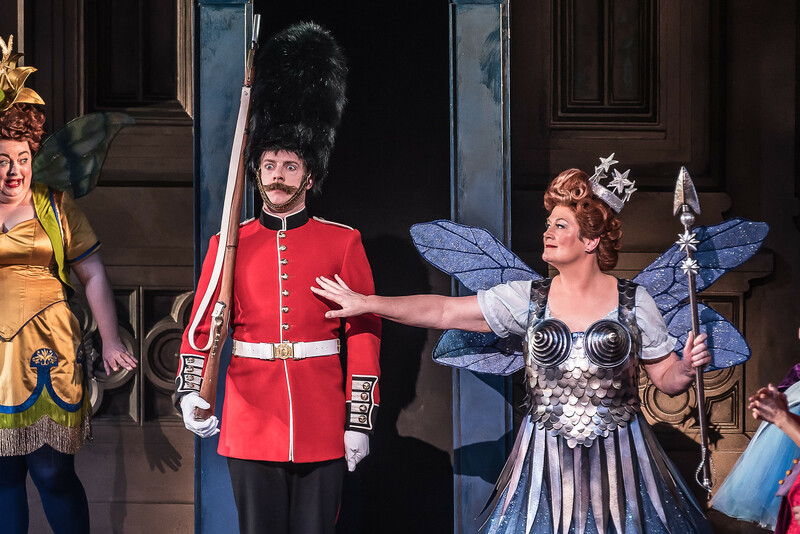 Llio Evans and Joanne Appleby made a delightful pair of fairies, both strong visually and vocally, aided and abetted by Flick Ferdinando's more physical Fleta. Whilst Richard Leeming made his straight-guy page boy a delight. This was very much an ensemble production, as G&S should be, with all the cast working together and creating a real feeling of communal joy and without being overly knowing. One of the innovations of G&S's operettas is the way the chorus is given a particular and detailed character. For both the fairies and the peers, individual members of the chorus were strongly characterised and McCrystal had taken Gilbert's topsy-turvy to heart. The fairies (led by the Amazonian/Brunnhilde-like Fairy Queen) were richly characterised and very feisty, with a great deal of common sense. Whilst the peers were all pompous, lacking in common sense and full of pointed caricatures which delighted. And everybody danced, the ENO chorus not only sang beautifully but kicked up a storm with its dancing too! Not all the dialogue worked perfectly, but this is something which will bed in with time but all of the punch lines did tell, which is a great achievement. As the Queen of the Fairies mentions Captain Shaw, the founder of the London Fire Brigade, in her song 'O foolish fay', McCrystal introduced him as a character, played by Clive Mantle. Mantle appeared before the overture to introduce himself as the theatre's fire officer and each act was preceded by one of Mantle's funny monologues, whilst there was a running gag through the piece of him appearing to put out the flames after each of the Fairy Queen's works of magic. Iolanthe is one of Sullivan's most sophisticated scores, the music references both Mendelssohn's fairies and Wagner, and the preponderance of lead characters means that there is plenty of material. Conductor Timothy Henty had prepared a new edition of the operetta based on Sullivan's autograph manuscript (acquired by the British Library in 2015). So whilst there were no major revelations, all the details were as Sullivan intended rather than with the accumulated wealth of traditional changes. The ENO Orchestra under Henty's direction really brought out these details with a sense of joy, whilst never overwhelming the singers (always of prime importance). Henty and the orchestra made the accompaniments buoyant, so that the music really did dance and the long strophic songs never became routine. How to make Gilbert & Sullivan's operettas work as a modern piece of theatre, rather than preserving them in aspic, is a perennial problem which each director needs to solve. 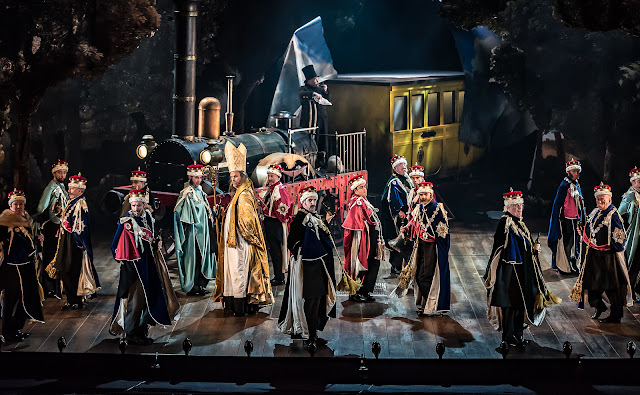 McCrystal and his team paid Gilbert and Sullivan the compliment of treating their stage-craft seriously, and with finely detailed ensemble performances from cast, chorus and orchestra, the result was a complete delight. This was only McCrystal's second opera production (he directed Haydn's Il mondo della luna for English Touring Opera), and I certainly hope he gets asked back.